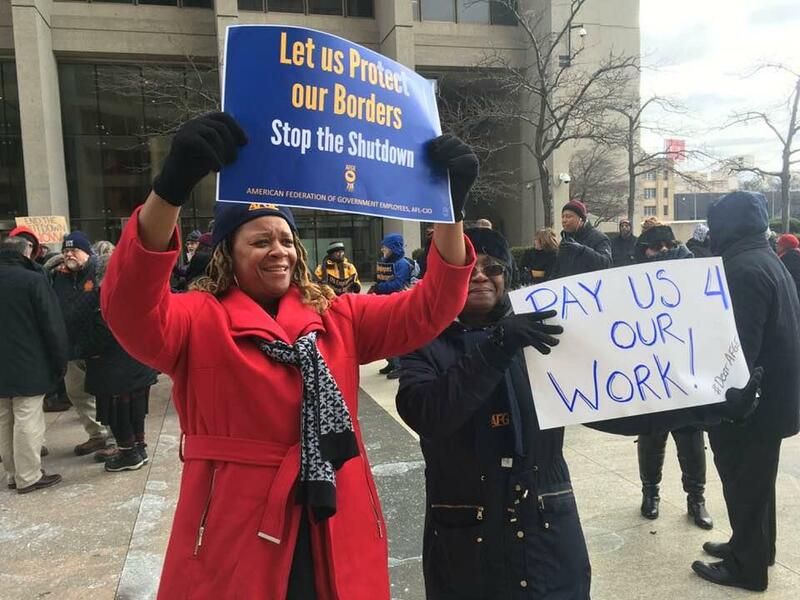 Michigan-based federal workers rallied against the partial government shutdown in Detroit’s Federal Plaza Thursday. The workers say the shutdown is putting the public at risk, and families in financial peril, as the shutdown driven by President Trump’s desired border wall drags into its third week. Federal workers and their supporters protest the ongoing partial government shutdown in Detroit. Jeff Kimble is part of the emergency response corps for the Environmental Protection Agency. He’s furloughed right now. Kimble is among around 380,000 federal workers on furlough nationally. Another 420,000 are working without pay, according to the American Federation of Government Employees. The union organized Thursday's rally. The workers say they’re being held hostage in a political war over President Trump’s border wall. They urged Trump and Congress to pass a budget and fund federal agencies. Marshia Cordray has been furloughed from her job with the Food and Drug Administration. About a year from her planned retirement, she’s been forced to dip into savings to survive without a paycheck. But Cordray says she’s actually doing all right compared to some of her younger colleagues.